By Jim Dower: Saul Canelo Alvarez is still looking shredded despite having been out of the ring for the past 8 months following his 12 round draw against middleweight champion Gennady Golovkin last September. Canelo, 27, is coming off of recent knee surgery to fix a problem that he had in his right knee. He now looks like he’s making substantial progress in healing from the surgery. Taking a page out of featherweight contender Ryan Garcia’s playbook, Saul Canelo posted a video of himself dancing on social media this week. This is a move to please his boxing fans, and likely bring in the female fans the way that Garcia has pulled in the girls/women without even having accomplished anything in the sport. Garcia takes it to the next level with his social media posting with his dancing and posing. What’s surprising is how ripped the former 2-division world champion Canelo Alvarez (49-1-2, 34 KOs) is looking right now. Canelo looks almost as defined as he did in his last fight with GGG on September 16 last year at the T-Mobile Arena in Las Vegas, Nevada. 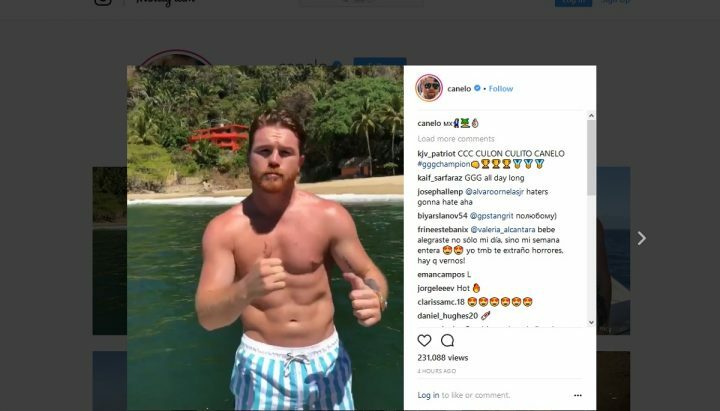 Canelo had never looked so defined before during his career in any of his fights, and he still looks like he’s in identical shape 8 months later without being training camp. Canelo is obviously doing some training for him to look this shredded. No one looks as shredded as Canelo is looking without tons of hard work to stay in this shape. Canelo’s promoters at Golden Boy Promotions are trying to broker a deal with Golovkin’s promoter Tom Loeffler for a fight on September 15 on HBO PPV. If a deal can’t be made soon, Golden Boy CEO Oscar De La Hoya says they’ll need to go in another direction because they can’t afford to find an opponent at the last second to fill the date. Gary ‘Spike’ O’Sullivan is believed to be on standby to step in and face Canelo on September 15. It’s not a great fight, but it’s a good enough one to please the boxing public for a replacement opponent. Canelo signed up for VADA last week to begin random year round testing for drugs. This was a move that Canelo had to take to show the boxing fans that he’s a clean fighter. Golovkin wants to make sure Canelo is being tested before he signs a contract for a rematch with him. GGG still hasn’t signed the contract for the rematch. There are still areas that GGG and his promoter Loeffler need to be agreed upon before they’ll ink the contract. With the VADA testing no longer an area of contention, the venue for the rematch is likely one of the crucial points that need to be agreed on. Golovkin doesn’t want to go back to Las Vegas for the rematch, which he refers to as, ‘The scene of the crime’ in talking about his previous fight with Canelo last September. But it’s likely that Golden Boy and Canelo will dig their feet into the sand to make sure the rematch with Golovkin takes place in Las Vegas at all costs. Whether Canelo and Golden Boy is willing to lose the rematch with Golovkin in their insistence in getting the fight staged in Las Vegas remains to be seen. If they’re that obsessed with having the rematch staged in Vegas, you have to wonder why. It would seem that the fight would be the most important thing, not the venue. If you lose the Canelo-GGG II rematch because of the disagreement over the venue, then nobody wins. Canelo gets stuck with O’Sullivan and/or David Lemieux, and Golovkin winds up facing Billy Joe Saunders or Sergiy Derevyanchenko. Those are not big money fights. Canelo will be turning 28-years-old in July. He’s still young but it seems like he’s been fighting forever due to his early start to his career 13-years-ago in 2005. It works for Canelo to take his time and make sure he gets whatever he wants out of the negotiations for the rematch with Golovkin. Canelo has time, the 36-year-old GGG doesn’t. He’s got to make the fight with Canelo happen soon before he ages out. It’s a tough situation to be in for Golovkin, but that’s the way it is. If Canelo sticks around in the sport as long as GGG, he’ll likely have to deal with the same thing.